Heart Internet Review 2019: Is Heart Internet a Good Hosting? Heart Internet is a web hosting company based in the U.K. They specialize in flexible reseller hosting packages, but they also offer a range of shared hosting, VPS (managed or unmanaged), and dedicated server packages. Heart Internet is a web hosting company based in the U.K. They specialize in flexible reseller hosting packages, but they also offer a range of shared hosting, VPS (managed or unmanaged), and dedicated server packages. Founded in 2004, Heart Internet is now the fifth largest web hosting provider in the country and has won several awards for their hosting services. One nice perk about their packages is that if you happen to exceed your current customer capacity, you won’t have to purchase an entirely new server. You can just add a single customer; you’ll only be charged for each additional website you add. Also, the rate you’re charged decreases as you add more customers, which means the more customers you have, the greater your profit margins. Besides their Reseller packages, Heart Internet also offers shared, VPS, WordPress, and dedicated server hosting services. Their entry-level shared hosting packages, while generous with space and bandwidth allocations, aren’t as budget-friendly as they claim to be. For instance, the Starter Pro plan doesn’t include any MySQL databases or PHP support, and the provided installations are limited to a little over 10 of the most popular apps – cutting out WordPress entirely. It also doesn’t include a free domain registration and has a setup fee. That said, it does come with 1,000 mailboxes, autoresponders, and mailing lists, so perhaps the value-add is there for small businesses that require many custom domain email addresses. They’re well-known in the U.K. market for having won ISPA’s “Best Shared Hosting” award in 2015 and 2016: they stood out from the crowd for their impressive array of apps, high reliability, and excellent security and support. Heart Internet’s Reseller Pro package can be paid either monthly or yearly; the latter affords you a discount equivalent to three months of free service. You also get one month free when you subscribe to an annual contract for their VPS hosting services. The same discount doesn’t extend to their shared hosting packages, however. There is no free plan available with Heart Internet, but they do include a 30-day money back guarantee with their shared hosting packages. Changing your plans seems to be a somewhat onerous task with Heart Internet. You can’t do it directly from the account management portal. Instead, you’ll have to back up and cancel your current hosting account, purchase the new plan that you’d like to switch to, then upload everything onto the new account and transfer your domain name over. In the meantime, your website will experience some downtime. Their support team is based in the U.K. and is available 24/7 via a ticketing system and live chat. This live chat and ticketing system aren’t immediately accessible on the main website – you’ll have to log in to Heart Internet’s Customer Area to access it. There’s also a telephone support hotline available, but Heart Internet recommends that you use the ticketing system or live chat instead, as this ensures greater account security and affords their support representatives faster access to relevant account details. Heart Internet recommends that before you contact customer support, you first check on system status (in case there are any server issues or scheduled maintenance periods) or go through their knowledge base to find answers to frequently asked questions. The knowledge base is fairly extensive and search function is relatively easy to use – though users should note that instead of typing in full questions, they’d be better off searching with key words instead. Heart Internet sets itself apart in the U.K. market with its high reliability, affordability, and feature-packed packages. If you’re looking for a low-cost way to get into the web hosting business, their Reseller Pro package is an excellent choice. 24/7 support based in the U.K. 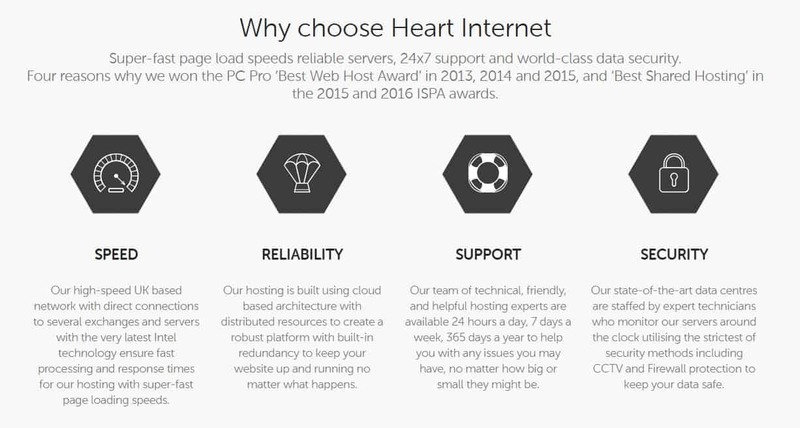 Wondering how Heart Internet stacks up against other Web Hosting companies? Enter any other Web Hosting company and we will give you a side-by-side comparison.